You'll be £20.00 closer to your next £10.00 credit when you purchase The First Helicopter Boys. What's this? The Indonesian Confrontation that raged from 1963 to 1966 stemmed from Indonesia’s opposition to the creation of Malaysia. Fighting in the challenging jungle terrain of Borneo and in the countryside straddling the Malaysia/Indonesia border, where there were few roads, posed significant logistical challenges to both sides. That the conflict was ultimately a victory for the Commonwealth forces was in due in no small part to the fact that they enjoyed the advantage of vastly superior helicopter resources and better trained crews – many of which were provided by British units. During the Confrontation, many of these vital helicopter assets were flown by pilots and crews who had gained their knowledge and experience first-hand during the Malayan Emergency, one of the Cold War’s first flash-points which had begun in 1948. 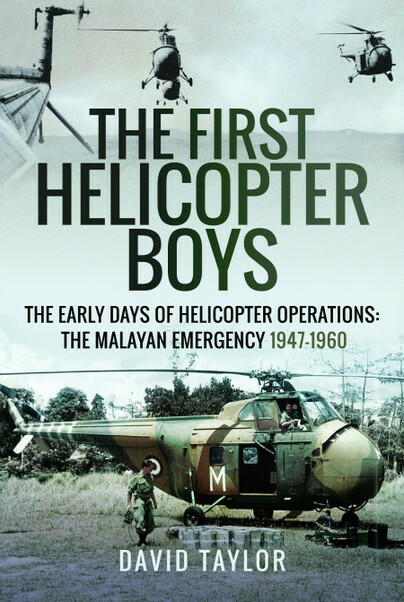 Without doubt, the Malayan Emergency marked the formative years of the RAF’s and Royal Navy’s helicopter operations – the very early days in fact, when equipment and knowledge were much more basic. It was a time when operational procedures were still under development, even though the helicopters were already being flown on front line service. Told in the main through their own words, by the RAF and Royal Navy air and ground crews involved, this is the story of how these ‘guinea pigs’ undertook many of Britain’s first rotary wing combat operations and, therefore, cemented their rightful place in the history of the helicopter. Born in Yorkshire, where he still lives, DAVID TAYLOR left school at the age of fifteen. After a brief period as a motor mechanic, he joined the RAF and saw the world, literally. In his ten years of service – three of which were spent in Far East – he visited thirty-eight countries. Emigrating to America in 1964, he secured a job in the oil industry. It was to be a fleeting emigration, but a long period away from home – thirty years – during which he again travelled extensively. Ninety-two countries at the last count, some of which he knows very well, and which provide background locations for the adventure novels on which he is currently working.